- Who can outsource via ProZ.com? - What kind of jobs can be posted at ProZ.com? - Can I use the job posting form to advertise my services? - What type of jobs are not allowed at ProZ.com? - What are the fees I will have to pay? - How are prices and deadlines set for jobs? - Where do I enter rates information? - I posted a job and no opportunity was provided for me to enter a budget range. Why? - Why was the option to enter rates information from the start removed? - What if no one quotes within my budget range? - When I am given an opportunity to indicate a budget range, how should I go about estimating? - Should I enter a budget range that is a bit lower than what I can actually afford to pay? - I offer a service for translators seeking jobs. Can I post? - For what reasons can a job poster be banned from ProZ.com? - I've posted a job but it is not visible yet. - What are the keys to getting a good response to my posting? What else should I bear in mind? - How will service providers contact me? - How quickly will I hear from translators (or interpreters)? - Will service providers be quoting against each other? - How can I be sure a given translator is reliable? - If I post a job and find a great translator, can I work with him/her directly next time? - I don't have a specific job -- but I would like to increase my database of translators. - I don't want to announce my job--its confidential. What can I do? - What can I do if I need to edit the information on my job posting? - How can I close a job posting I've made? - What does it mean for a job to be funded by a non-profit group? - What relation is there between job posting and the Blue Board? - What is job posting history (Previous job postings)? - I need to edit my name in a posted job. How can I do this? - Once I choose "Accept quote" does this mean I am awarding the job to this one vendor? - Where can I see quotes received? - How are jobs passed? - Who can receive jobs? - How do I get jobs at ProZ.com? - Why don't I see payment information in job postings anymore? - I am an experienced translator, but I am new to freelancing. How do I go about determining what I need to charge on a given job? - I've indicated a preference to see client budgeting information before deciding whether to quote, and as as a result I sometimes see that information. Do I have to quote within the client's budget range? - Is it safe to consider the budget ranges entered by clients as indicative of the going rates in the market? - What if after I quote the client comes back and offers me less than the rates I have determined I need to charge? - Are the translators who give the lowest quotes always the ones selected? - I understand all of this in principle, but I am not sure I can do this on my own. - How can I quote? - Can I edit a job quote after I submitted it? - Where can I see my job quotes history? - How can I control what is posted on my quote form? - Can I withdraw a quote I submitted for a classic job? - What are the ProZ.com fees associated with jobs? - What is a "potential" job? - Who sets the payment and delivery terms of each job? - Does ProZ.com verify information in posted jobs and job descriptions against poster websites, online information or other sources? - Does ProZ.com check job postings to filter-off jobs posted by potential scammers? - What payment types may I accept from outsourcers? - I have a question about a particular job posting. Who should I contact? - Do I have to pay to quote? - If I quote on the job and don't get it, will I be informed? How soon? - Where can I see an outsourcer's job posting history? - Should I use the quote form to express my interest in a job, or should I write to the client directly? - Where do I insert the translation of the sample text in my quote? - The job page says I meet the criteria for quoting on the job, but I cannot see the "Submit quote" button. Why? - The native language and the language pairs in a job posting are not consistent. What should I do? - Why am I not allowed to quote on certain jobs? - Why are some jobs marked members-only? - What does the "Note: Job is more than 30 days old" message mean? - I have not received payment for a job I have done. What can I do? - Why doesn't ProZ.com set a minimum rate for translation? - What are Automatic Referrals? - Does ProZ.com offer text ads (like Google), so that I can advertise my freelance services? - There is a job posting in which the outsourcer's budget is below the legal minimums in certain countries. Can it be removed? - Can I edit a job quote after submitting it? - How can I find out what the real going rates are? - If I am free to quote whatever price I want, why would I even look at the client's budget range? - A job was posted with a language variant that, in my opinion, does not exist. Is this allowed? - What is the translation center? - Is the translation center a TMS (translation management system)? - Why do companies use the translation center? - Can I customize it with my logo? - What is the cost of using the Translation Center? - What about privacy and data security? - What if my company requires additional protections? - What translators will work on my projects? - Can I use the platform to recruit? - Can translators use their ProZ.com login details? - Can I have translators on the platform that are not ProZ.com users? - Can I manage agreements I have with my translators using the platform? - I group my translators in teams working on the same subjects. Can I do that? - How are tasks assigned to translators? - Is there an option to allow clients to access my ProZ.com-powered translation center? - Can a large file be split and assigned to different translators? - How can I manage reference files? - Can I associate my work codes (and the client’s) with a work order? - What value does ProZ.com Connect! deliver over the standard job system and public directory tool? - What is the difference between ProZ.com Connect! and Business membership? - How and why was Proz.com Connect! created? - What is the difference between Connect! jobs and the "classic" job system? - What is a premium job? - Who decides whether or not a job is to be classified as "premium"? - Can I make a duplicate from a posted job and use it for a newer one? - The system is not allowing me to access Connect! platform. Why? - How can I send files to other site users? - Can I send multiple files to more than one site user at the same time? - What type of files can be sent/received? - What is the maximum size allowed for files sent/received? - Will I be notified of files I receive? - Where can I see received/sent files? - Can I also upload files to "My files"? - What types of files can I upload to "My files"? - Can I store files in "My files" for long periods of time? - Can others access "My files"? - Is there a storage space limit for my files? - How can I delete files? - How can I download files received? - How can I be sure a file is safe to download? - Will I be notified when others receive the file(s) I sent to them? - Can I specify a language and a field for my TM and glossary files? - What is a pre-qualified job? - How do prequalified jobs work? - How are pre-qualified jobs different from other ProZ.com jobs? - What are the benefits of pre-qualified jobs for outsourcers? - What are the benefits of pre-qualified jobs for service providers? - Who can post pre-qualified jobs? - Where can I post a pre-qualified job? - Who can reply to pre-qualified jobs? - What are private job postings? - What is the purpose of private job postings? - How are eligible providers for a private job posting determined? - How can I be considered eligible for more private job postings? - Why can't I access a particular private job posting? I think I meet the eligibility requirements. - Are private jobs also subject to vetting? - What is turn-key translation? - How will I get paid? - Is there any fee for receiving payment via my ProZ.com wallet? - How is invoicing handled? - How are taxes handled? - How are the rates determined? - What if the client has complaints about the quality of my translation? - What if I am unable to deliver the translation on time? - How is the translator chosen for a turn-key translation? What criteria are used to determine eligibility? - What is turn-key translation? What's the advantage for clients? - For what type of work is the system intended? - How will I receive the completed translation? - Is ProZ.com a translation agency? - If I order a translation and find a great translator, can I work with him/her directly next time? - What fees are charged? - How is payment handled? - Which are the currencies available for Turn-key jobs? - How are tax issues handled? - Is the translation reviewed by a second provider before being delivered? - What if I am not satisfied with the translation that is delivered? - The language pair I need for my job is not available in the list of language pairs for Turn-key jobs. What should I do? - I am not getting any email notifications of jobs. - What is the criteria taken into account for classic jobs notifications? - I am not getting all the email alerts I should be for jobs. - Why am I not notified of all jobs in my language pair? - Why are job alerts sent to me some time after they were posted? There seems to be a delay. - What are "Classic" job posting notifications for Corporate members? - I received a job notification through ProZ.com that did not come through the directory, direct profile contact or from a ProZ.com job post, what is it? - What is the RSS feed for jobs? 1.1 - Who can outsource via ProZ.com? Any business or individual can outsource via ProZ.com. If the posting method is used, certain contact information is required: name, email, phone, country, etc. For InstantJobs, payment must be made in advance by credit card. 1.2 - What kind of jobs can be posted at ProZ.com? Translation, interpretation, localization and other jobs requiring the services of multilingual professionals or companies may be posted. 1.3 - Can I use the job posting form to advertise my services? No. There is no possibility that you will find a client using this form. Instead, you will only inconvenience fellow service providers, who expect only legitimate job opportunities to come via this form. Your right to enter quotes on jobs will also be revoked. 1.4 - What type of jobs are not allowed at ProZ.com? Please refrain from posting job notices that do not specifically require the services of multilingual professionals. Also, job postings may not contain content of an adult nature. 1.5 - What are the fees I will have to pay? There are no fees for posting jobs at ProZ.com. There are also no commissions. This is possible because ProZ.com charges a yearly subscription fee to the service providers. 1.6 - How are prices and deadlines set for jobs? The ProZ.com job form will only help you to meet service providers. Project details--work content, payment, deadline, etc.--must be agreed upon between you and the service provider directly. 1.7 - Where do I enter rates information? First enter details related to the job, providing as much detail as possible. If among those who meet the criteria there are ProZ.com members who prefer to take your budget range into consideration when deciding whether or not to quote, you will be given an opportunity to provide a budget range. 1.8 - I posted a job and no opportunity was provided for me to enter a budget range. Why? This means that none of the professionals who meet your job criteria has a habit of considering client budgets before quoting. Any quotes you receive will have been based on the information you supplied in the job posting. 1.9 - Why was the option to enter rates information from the start removed? To reflect the fact that the individual translator is in the best position to determine what he or she needs to charge on a given job. For more information, see: About > Job posting changes. 1.10 - What if no one quotes within my budget range? ProZ.com is home to the world's largest network of professional translators. If none is willing to work within your budget, you may want to consider either increasing your budget or seeking alternatives. For more information, see: Translation: Determining what service you need and what it will cost. 1.11 - When I am given an opportunity to indicate a budget range, how should I go about estimating? If you have no experience in pricing translation, you might want to pass on entering a budget range. If you do decide to enter a range, consider consulting the guide: Translation: Determining what service you need and what it will cost. That document links to data on the rates charged by translators registered with ProZ.com. 1.12 - Should I enter a budget range that is a bit lower than what I can actually afford to pay? That is up to you, but entering your real maximum helps ensure that the job is visible (and appealing to) a larger group of professionals. 1.13 - I offer a service for translators seeking jobs. Can I post? No. The job posting form is for proposing business arrangements of one type: job poster paying posting recipient to perform services. Web portals, those selling databases of translators, etc., or anyone suggested an arrangement whereby the recipient of a posting would be paying the poster, will be regarded as an illicit advertiser. The posting will be removed, associated memberships will be revoked, and you will be banned from future postings. 1.14 - For what reasons can a job poster be banned from ProZ.com? Please refer to the ProZ.com termination policy. 1.15 - I've posted a job but it is not visible yet. If you are a basic user of the site, your job posts will require vetting. This is usually done within 12 hours of the entry being posted. You may also want to check to make sure you have provided complete and correct contact details. If your job hasn't appeared after a 24-hour period, please submit a support request. 1.16 - What are the keys to getting a good response to my posting? What else should I bear in mind? When posting a job, it is important to be as descriptive as possible with regard to the nature of the work, as well as your requirements for service providers. In addition, it is very important that you supply complete information about yourself and/or your company. The best service providers are in high demand, and will generally not pursue jobs with questionable clients. Complete contact details, and perhaps a brief history of your company, may help you to kick off mutually beneficial relationships with top professionals. Jobs posted should respect the principle of equal opportunity. Please do not post jobs on behalf of third parties. Please note that the contact details marked as mandatory on the Job Posting Form must be completed in each case - job postings with incomplete details will be removed by ProZ.com staff. Where possible, jobs involving multiple language combinations should be aggregated using the corresponding function available on the Job Posting Form. 1.17 - How will service providers contact me? You may indicate your preferred method of contact (email, phone, online application form, etc.) Service providers are encouraged to respect your preferred method of contact; some outsourcers consider it a bad omen when a service provider ignores contact preferences, and will not work with those service providers. 1.18 - How quickly will I hear from translators (or interpreters)? When a job is posted and approved by site staff, email notification is sent to each professional whose profile matches the requirements of your job. Depending on how unique or general your job requirements are, you may expect to begin hearing from service providers within minutes. If your job is in a common language pair -- European languages, Arabic, Chinese, etc. -- you are encouraged to be very specific in your demands related to subject area expertise, etc. This will help to ensure you get the most suitable quotes from a manageable number of service providers. 1.19 - Will service providers be quoting against each other? No, those who contact you will not have seen quotes from others. Service providers are encouraged to offer rates and turnaround times that allow them to offer their best work. Use your judgement in deciding whether a quote may be unreasonably low (thereby making it difficult to deliver careful work), or unreasonably high. 1.20 - How can I be sure a given translator is reliable? Consider the professionals' training and degrees, years in the field, credentials earned, membership in professional associations, references, etc. Professional experience outside of translation may also be relevant. You may want to discuss the content of your job with the translator in order to assess their understanding of the material. It is not unusual for a client to ask for a short excerpt from a job--100 words or so should be enough to get an idea--before assigning work to a new translator. (Note that some translators include samples of their work in their profile 'portfolios'. In addition, looking at a translators' KudoZ history is sometimes useful in understanding a translators' style or approach to terminology.) Lastly, you may want to consider working with a ProZ.com Certified PRO. 1.21 - If I post a job and find a great translator, can I work with him/her directly next time? Absolutely. Once you have established a relationship with a ProZ.com translator or interpreter, you may find it is in your best interest to continue working only with that person. Nurturing a long-term service arrangement will bring benefits over time, as the service provider will be able to deliver high quality work in a shorter period of time, as he or she becomes increasingly familiar with terminology and information specific to you or your company. 1.22 - I don't have a specific job -- but I would like to increase my database of translators. You may post once a month, with a maximum of five job postings each time. Repeatedly posting calls for translators, without actual jobs, is regarded as intrusive by many professional service providers. For this reason, your potential posting may not be made visible on the ProZ.com homepage. When posting a call for CVs for potential future projects, it is very important that you post complete information about your company and the types of jobs you tend to obtain. Your posting may be removed if such information is not provided. 1.23 - I don't want to announce my job--its confidential. What can I do? If your job is confidential, do not use the job posting form. Consider using the ProZ.com directory to find service providers who meet your requirements. When you find a suitable service provider in the directory, you can contact him or her directly. 1.24 - What can I do if I need to edit the information on my job posting? Before the job posting has been vetted, there is an "edit job" button at the top of the job posting which will allow you to edit your listing. However, once your job has been vetted and is visible by the public, you will not be allowed to edit your job posting. But, if you need to add anything to your job posting, you may still add an "addendum" to it instead. 1.25 - How can I close a job posting I've made? As the outsourcer, you can close your job posting on one or more language pairs, or close the posting entirely. 2. Below each language pair, there is a 'Click to close' link. Clicking this will close the job to further offers in that pair (it can be re-opened later using the same method). 3. When all pairs have been closed, the entire job is closed. 1.26 - What does it mean for a job to be funded by a non-profit group? A non-profit group is an organization which exists for educational or charitable reasons, and from which its shareholders or trustees do not benefit financially. Some translators are willing to reduce their rates when working for a non-profit group they deem worthwhile. Jobs posted on behalf of non-profit organizations should include the name of the group, and a publicly visible link to a website with further information about the organization. Jobs marked as non-profit that do not meet these requirements will be removed by site staff. Government organizations and similar entities are not covered by this definition; jobs funded by such entities should not be posted as 'non-profit'. 1.27 - What relation is there between job posting and the Blue Board? Job posters may be added to the Blue Board. 1.28 - What is job posting history (Previous job postings)? The job posting history page lists the most recent 100 jobs posted by an outsourcer (based either on outsourcer's Profile or email address). Potential candidates can view the past job postings made by an outsourcer using the 'Previous job postings' link in the 'About the outsourcer' box when viewing a job. Outsourcers may view their own job postings using the same link when viewing a job they've posted, or by using this page: Job posting history. 1.29 - I need to edit my name in a posted job. How can I do this? To edit a job which was not vetted visit a job page and click on "Edit job". In edit mode, check if your contact details are full and correct as requested in the job posting rule #9. Note that you can make your real name invisible to potential candidates just by entering the title of the position you occupy in your company. To do so, un-check the "Show publicly" option next to the real name field in the job posting form and select "I represent a company". A new field will show up as "Contact person's job title" . Make sure you report your company name in the Company name field. 1.30 - Once I choose "Accept quote" does this mean I am awarding the job to this one vendor? Not at all. You can select as many quotes as you need to implement the project. It is possible to select all necessary quotes at once and save changes or select quotes and save changes on a step by step basis. Once you select a service provider’s quote and save changes you will see a note on a selected quote like "This quote was accepted". Upon quote acceptance a notification will be sent to a service provider. After accepting quotes you might wish to discuss project details with service providers. Note: A job will not be closed once you select a quote(s). It can be closed by you manually (if you want so) or it will be closed automatically due to expiration of its quoting deadline time. 1.31 - Where can I see quotes received? To see a list of jobs quotes you have received, go to "My posted jobs" from the "Jobs & directories" tab, find a job you are looking for and click on [View quotes] on your right. A list of all quotes will be opened. ProZ.com members are meeting them. 2.1 - How are jobs passed? Method (1) is the only visible method of job matching; jobs of the other form are passed privately. Method (2) accounts for about half of all jobs passed. 2.2 - Who can receive jobs? Any registered user of ProZ.com can receive jobs. However, job posters may choose to restrict a job to those meeting certain criteria. See this FAQ for more information about restricted jobs. 2.3 - How do I get jobs at ProZ.com? b) Membership, as members are ranked ahead of non-members in the directory. c) KudoZ PRO points in your language pairs and fields of expertise, as this is how search results are ranked among the first group (members) and the second group (non-members). d) Specialization. Make sure to have on top your main language pair and your main field of expertise, get KudoZ in this combination, show that specialization in each area of your profile. For more information on ProZ.com directory, see this FAQ section. 2.4 - Why don't I see payment information in job postings anymore? Certain changes were recently made to the job posting system to reflect the fact that the translator is in the best position to determine what rate he or she needs to charge on a given job. Budget / pricing information is only shown to logged in users that meet the requirements of the job. You may choose if you would like to show or hide budget / pricing information for jobs where you meet the requirements. For more information, see: About > Job posting changes. 2.5 - I am an experienced translator, but I am new to freelancing. How do I go about determining what I need to charge on a given job? For guidance on this topic, see the article Determining your rates and fees as a translator. 2.6 - I've indicated a preference to see client budgeting information before deciding whether to quote, and as as a result I sometimes see that information. Do I have to quote within the client's budget range? No. The budget range provided by the client is strictly for use in determining whether or not you will take the time to quote. When quoting, you should never offer to do a job for less than the amount you need to deliver work at the quality level that is required, irrespective of the budget range specified. 2.7 - Is it safe to consider the budget ranges entered by clients as indicative of the going rates in the market? No. Clients budget ranges often fall below the going rates. 2.8 - What if after I quote the client comes back and offers me less than the rates I have determined I need to charge? Turn it down. Only you can know what you need to charge to deliver work at the quality required on an ongoing basis. Ultimately, it is your responsibility -- to colleagues and clients -- not to charge less than that amount. 2.9 - Are the translators who give the lowest quotes always the ones selected? No. Experienced clients know that it is not possible to deliver quality consistently when rates are below a certain level. Therefore, the translators who are successful in connecting with new clients via ProZ.com tend to be those who quote within the normal range for professionals. 2.10 - I understand all of this in principle, but I am not sure I can do this on my own. You're not alone! Reach out to other ProZ.com members via the site or at a local powwow. You are sure to find loads of support. 2.11 - How can I quote? Note that not all job postings accept quotes. Some outsourcers prefer to be contacted directly via email and so their email address is made visible in the "Contact information" section of the job posting (and so the "Submit quote" button is not visible). However, when the particular job posting you are interested in is accepting quotes, to begin the process you need to click on the "Submit Quote" button at the top or bottom of the posting to be able to enter your proposed rate. Once you are on the "Quote Form", you will be able to submit your rate that you are willing to work for. Once you finally submit your quote to the outsourcer, they are given the option to select "No action", "No thank you", or "Accept" regarding your quote. To view past quotes, please click on "My Quotes" in the "Jobs" menu bar on the homepage. 2.12 - Can I edit a job quote after I submitted it? No. Job quotes cannot be edited once they have been submitted. However, you may add a note to your quote and enter any other relevant information. 2.13 - Where can I see my job quotes history? To see a list of jobs quotes you have submitted, go to "My quotes" from the "Jobs & directories" tab. Please bear in mind that only ProZ.com members can see their own job quotes history. That information is not available to other ProZ.com users or outsourcers. 2.14 - How can I control what is posted on my quote form? If you go to your "edit personal data" you are able to control the information that will be entered on the quote form regarding the name, address, phone/fax number, etc. 2.15 - Can I withdraw a quote I submitted for a classic job? Yes. You can remove a quote submitted for any classic job by clicking on "Delete" next to the quote you would like to withdraw in the My quotes page. 2.16 - What are the ProZ.com fees associated with jobs? Direct jobs: Outsourcing is entirely free. So is maintaining a profile for the purpose of obtaining direct jobs. Posted jobs: Posting a job is free. Answering and posting a quote is free and unlimited for ProZ.com members. On Instant Jobs, a commission on the overall value of a job is taken by ProZ.com. The payment shown for Instant Jobs is the payment available to the service provider; the commission has already been subtracted. 2.17 - What is a "potential" job? A "potential" job is any job posted without defined scope and/or details; in particular, calls for CVs or similar general invitations to establish a business relationship. 2.18 - Who sets the payment and delivery terms of each job? All the terms of each job are worked out by direct negotiation between clients and service providers. ProZ.com staff play no role in setting terms or verifying that they are met. 2.19 - Does ProZ.com verify information in posted jobs and job descriptions against poster websites, online information or other sources? Basic information is verified by site staff (contact information, for example) to ensure that job posts are within site rules. ProZ.com does not ascertain the veracity of outsourcer web site descriptions or other information; each translator interested in working with a given outsourcer is expected to investigate potential clients to the fullest extent possible before deciding whether or not to work for them. 2.20 - Does ProZ.com check job postings to filter-off jobs posted by potential scammers? The job posting system was designed to enable outsourcers to post their job offers to the ProZ.com community. While any business or individual can outsource via ProZ.com, jobs posted by basic site users (non-logged-in users and non-members) are checked by site staff before being made visible. In many cases the information included in a posted job is enough to identify a scamming operation, or a job posted by an oursourcer banned from ProZ.com,and the job posts are quietly deleted. In other cases the posted information will not be enough to to identify a scammer and the job is approved, and at this point the translators' risk management procedures should begin. Risk management should be a set of processes including the positive identification of the "client" (contact data verifiable and verified) and the verification in risk management resources such as the Blue Board, among other steps. If you would like to learn more about how to manage risks, I invite you all to attend an upcoming free webinar offered by site staff on "Risk management for freelance translators and interpreters". ProZ.com members can also subscribe to translators scam alert reports. 2.21 - What payment types may I accept from outsourcers? First off, when an outsourcer and a translator meet via ProZ.com and agree to do business, all details are agreed upon between the two parties, and ProZ.com is not involved in any way. So it is up to you to negotiate with your business counterpart concerning payment method and terms. That said, there are several common methods in use for payments. Wire transfer is one method of making payment, checks are another. PayPal and Moneybookers are online services that facilitate cash transfer. There is also Western Union. Each of these payment methods has benefits and drawbacks, and one may be suitable for a small project, another for a large project. Where you live is also a factor. This topic has been discussed frequently in the ProZ.com forums, which are freely searchable. I suggest you begin by browsing the Money matters forum. 2.22 - I have a question about a particular job posting. Who should I contact? You should contact the poster of the particular job directly. ProZ.com does not have any more information on jobs than what the poster chose to enter. It is the responsibility of the job poster to enter correct contact information. ProZ.com cannot respond to reports of job postings with incorrect links or lack of proper contact information; we have only as much information as the job poster chose to enter. 2.23 - Do I have to pay to quote? 2.24 - If I quote on the job and don't get it, will I be informed? How soon? The outsourcer will review all the quotes they receive. It may take a couple of days before they do that- it will depend on the deadline for the project. The outsourcer is asked to send a note saying "No Action Yet", "No Thank You or "Accept" to all people who quoted on the job. Note that the outsourcer is not required to do this, and if they choose not to, then you will not receive any notification on whether you were chosen or not. 2.25 - Where can I see an outsourcer's job posting history? ProZ.com members can see a list of jobs posted by an outsourcer by clicking on "Past job postings" at the bottom of the 'Job posted by" box in job postings or else by clicking on "More info »" at the bottom of the 'Past job postings' section of the outsourcer's Blue Board record. 2.26 - Should I use the quote form to express my interest in a job, or should I write to the client directly? You should follow the client's direction. When none is given, use the quoting form. You should never contact a client directly, or call, if the client asks that you do not. Doing so reflects poorly on you, on the ProZ.com community, and results in an inconvenience that almost certainly ensures you *will not* get the job. If ProZ.com staff receives complaints of a user contacting an outsourcer directly, against that clients' instructions, the user's profile may be limited or removed. 2.27 - Where do I insert the translation of the sample text in my quote? Require that the translation of the sample is sent together with the job quote. Do not require the translation of the sample text but just provide it as a reference material. If the outsourcer has provided a sample text to be translated and sent with the quote, then you should be able to enter your translation in the "Sample" field of your quote. However, if the translation of the sample is not a requirement, then the "Sample translation" field will be unavailable and you may include your translation in the body of your job quote. 2.28 - The job page says I meet the criteria for quoting on the job, but I cannot see the "Submit quote" button. Why? If the job is open and you still cannot see any option to quote for the job, then submit a support request. You can do so by clicking on the "Contact site staff if there is a problem with this job posting" link at the bottom of the job posting. This will help support staff look into the issue further. 2.29 - The native language and the language pairs in a job posting are not consistent. What should I do? First of all, notice that the native language required for a job may not always be one of the languages involved in the project but many times it may be the outsourcer's native language. Many outsourcers feel comfortable when doing business only in their own native language. This being said, you may submit a support request to ask staff to check this with the outsourcer to make sure there is no mistake in the selection of the native language and edit the native language for the job posting if the outsourcer confirms it is not the correct one. 2.30 - Why am I not allowed to quote on certain jobs? Job posters have been given the option to restrict who can submit quotes for their jobs based on certain criteria from user's profiles. These criteria are general fields of expertise, specific fields of expertise, credentials, software knowledge, location, native language. You will not receive notifications for jobs you cannot quote on. Job posters can also restrict users from submitting quotes based on their ProZ.com membership status. This, however, does not prevent you from receiving any job notifications. This box should clarify the requirements selected by the outsourcer and that do not match the information in your profile. You will also be given the option to visit your Profile updater and "[Edit]" the information in your profile accordingly. 2.31 - Why are some jobs marked members-only? Some clients choose to be contacted only by paying members. Others choose to open up the jobs to non-paying users after a certain period of time has elapsed. Times shown for job postings and member-only periods, like other times shown throughout the site, are expressed in Greenwich Mean Time. 2.32 - What does the "Note: Job is more than 30 days old" message mean? Please note that you cannot quote on a job that is more than 30 days old. For jobs which have been posted for more than 30 days, and specify 'Direct contact' (email) as the contact method, the outsourcer contact information will be hidden. If you cannot see the contact information for a job that is not 30 days old and for which you meet the criteria specified by the outsourcer, please submit a support request and provide the particular job URL for the job. Be sure to check the "Contact method" section of the job to make sure the outsourcer has not specified to be contacted via ProZ.com ('Quote' button) first. ProZ.com does not take a hands-on role in jobs. Receiving an email from the outsourcer means that your quote has been accepted and the outsourcer would like to assign the project to you. 2.34 - I have not received payment for a job I have done. What can I do? ProZ.com is not legally and/or professionally involved with any transactions/contracts between service providers and outsourcers. The site is only a venue. However, if non-payment is involved in 1) commissioned work that was done and 2) delivered on time, and 3) without quality complaints, you are welcome to register this issue along with an LWA entry on the Blue Board. Outsourcers are subject to the Termination Policy. Note: If you report a non-payment issue, you may be later asked to substantiate that your entry is in line with Blue Board rules. 2.35 - Why doesn't ProZ.com set a minimum rate for translation? We believe that each member should be entitled to set his or her own minimum rates. We provide a rates calculator to assist site users in making the necessary considerations, and provide optional filters so that in effect, a site user can set his/her own minimum rate. This is in line with the site's philosophy of not interfering in members' businesses. 2.36 - What are Automatic Referrals? Automatic Referrals appear to an outsourcer after they have posted a job. The ProZ.com system automatically selects the top five ProZ.com members that best match the criteria for the specific job. The outsourcer is presented with the list of these translators and a direct link to contact them. Outsourcers save time and hassle, and ProZ.com members receive more exposure that turns into more job offers. 2.37 - Does ProZ.com offer text ads (like Google), so that I can advertise my freelance services? Text ads may be purchased on the directory page. To get info, go to "My ProZ.com" > "My Text Ads" > "Info"
Many of those who have purchased these text ads have renewed, so it may be that they are producing results. The starting price is $20. Please consider giving them a try. 2.38 - There is a job posting in which the outsourcer's budget is below the legal minimums in certain countries. Can it be removed? If the violation is direct (ex. 2 units per hour where the minimum wage is 4 units per hour), please enter a support request so that staff members can consider removal. (A job posting can not be removed on the basis of assumptions as to work rate, however.) If you suspect a violation of this policy, please report it via the online support system (links are provided at the bottom of each job posting to facilitate this). The the "legal minimums" policy might apply, for instance, to an in-house position, where the concept of wages is clearly appropriate. While in most cases the policy may not apply to freelance workers, it was implemented in order to help cover the legal aspects of retribution to language professionals. The ProZ.com team is aware that the policy will apply to very few cases, but it is another way of building a structure of respect for the income of language professionals. The policy is not intended, and should in no way be used as a "benchmark" or measurement of what a freelancer should be charging or making on any given job-- far from it. An article has been started in the ProZ.com Wiki, Minimum wage by country, which references existing documentation on minimum wage allowed by law in different countries. Translators are encouraged to reference this information and add to it where needed. 2.39 - Can I edit a job quote after submitting it? No. Job quotes cannot be edited and, if removed, they cannot be re-submitted. However, If you made a mistake in your original job quote or you forgot to add important information, you can make an addendum by visiting the "My job quotes" page, selecting the specific quote and entering the new information in the write-in field available at the bottom of the quote page. 2.40 - How can I find out what the real going rates are? The article Determining your rates and fees as a translator. has links to rates data compiled at ProZ.com, by industry associations, etc. A methodology for working out what you need to charge to meet your own income needs and objectives is also provided in the guide. 2.41 - If I am free to quote whatever price I want, why would I even look at the client's budget range? You don't have to. Some people prefer to know the client's budget range so that they don't spend time quoting when there is little or no chance that the client will pay the rates they charge. 2.42 - A job was posted with a language variant that, in my opinion, does not exist. Is this allowed? According to point 6 of the ProZ.com guiding principles, job posters are the ones who define the way they present their needs to the community. Academic consideration on the existence or not of a given language variant are not relevant here, this is simply a channel for an outsourcer to further specify a translation request. Information in this field is not used to filter translators, so nobody will be excluded from the job. 3.1 - What is the translation center? 3.2 - Is the translation center a TMS (translation management system)? 3.3 - Why do companies use the translation center? 3.4 - Can I customize it with my logo? 3.5 - What is the cost of using the Translation Center? It is included in your ProZ.com Business membership fee. 3.6 - What about privacy and data security? 3.7 - What if my company requires additional protections? 3.8 - What translators will work on my projects? 3.9 - Can I use the platform to recruit? 3.10 - Can translators use their ProZ.com login details? 3.11 - Can I have translators on the platform that are not ProZ.com users? 3.12 - Can I manage agreements I have with my translators using the platform? 3.13 - I group my translators in teams working on the same subjects. Can I do that? 3.14 - How are tasks assigned to translators? * With manual assignment the PM will edit a task to manually assign it to one of the valid translators. * With automatic assignment, the valid translators will receive notifications inviting them to accept your tasks. Once all tasks have been accepted, no further notifications are sent and the job is blocked, avoiding the risk of having two translators working on the same file. You can remove translators from the queue, add suitable translators to the queue or send a direct message to a translator. 3.15 - Is there an option to allow clients to access my ProZ.com-powered translation center? 3.16 - Can a large file be split and assigned to different translators? 3.17 - How can I manage reference files? 3.18 - Can I associate my work codes (and the client’s) with a work order? * An internal order number that can be automatically indexed and formatted in a flexible combination of month, year and a numerical field. 4.1 - What value does ProZ.com Connect! deliver over the standard job system and public directory tool? Time savings searching for linguists – up to 50%. The new Requirements Wizard and new search engine in Connect! enable very targeted filtering to find relevant translators faster. Faster response from translators. Because you are using Connect! to source for premium jobs, your inquires get higher visibility in the network and receive greater attention from translators when they hear from you. Candidate Management. Filter responses, communicate with candidates via a convenient message center and easily organize your selected translators online. Plus, you can evaluate and easily keep track of your favorite translators. More flexibility and control. Be able to see who will be informed of your job opportunity before you post your job. Plus your sourcing and candidate management account is private only to your company, keeping your sourcing activities private and not visible to your competitors or clients. Broader reach. In some language pairs, Connect! provides access to many more translators than are available in the public directory. 4.2 - What is the difference between ProZ.com Connect! and Business membership? ProZ.com Connect! empowers your sourcing and linguist management activity. Business membership distinguishes you in the community as a company who supports ProZ.com and allows you to promote your business in the special corporate directory. Basic use of ProZ.com Connect! is included as one of the benefits of business membership. Learn more. 4.3 - How and why was Proz.com Connect! created? ProZ.com Connect! was developed, beta tested and piloted over a period of 10 months with the cooperation of 25 charter customers. Among them were six of the world’s twenty largest language companies and a number of global firms that purchase translation services, including a global 100 enterprise. Many mid-sized language companies also took part in the charter program, one with as few as two employees. We recognized that the traditional method of sourcing translators - wading through piles of CVs (curriculum vitae) and tracking candidates with spreadsheets and emails takes far too long to find the qualified candidates companies need – often for urgent assignments. As such, many language industry players working closely with ProZ.com, created a platform that solves these long-standing and costly problems. 4.4 - What is the difference between Connect! jobs and the "classic" job system? Connect! jobs are those posted via the ProZ.com Connect! platform. Connect! jobs allow outsourcers to define their requirements with more granularity, and to target a job more carefully to desired language professionals. Connect! jobs are shown only to those whose ProZ.com profiles match the requirements defined by the outsourcer. The "classic" job system refers to ProZ.com's original job posting system. "Classic" jobs are visible to some degree by all site users. 4.5 - What is a premium job? A job is considered premium when the project pays at or above market rates for the given language pair, and pays the translator a minimum of €100. 4.6 - Who decides whether or not a job is to be classified as "premium"? For now, Connect! clients have been asked to determine for themselves whether a job qualifies as "premium" according to the definition above. Note that it can hurt a company's reputation to mark a job as premium if potential candidates do not consider it as such. It is therefore in an outsourcer's own interest to be selective about which jobs it calls premium. If you feel a job has been posted as premium and the above conditions have not been met, please enter a support ticket, citing the specific post with a URL. 4.7 - Can I make a duplicate from a posted job and use it for a newer one? Yes, you can make a copy of the posted Connect! job. To do so, open a new Connect! job and click on Copy details from a previous job on the left upper corner. Select a job to copy the details and you will be redirected to the Edit Requirements page. 4.8 - The system is not allowing me to access Connect! platform. Why? If your profile is associated with a company whose ProZ.com Blue Board record has a low average LWA (below 2.5 within the past 12 months) or else has an active non-payment complaint your access to Connect! platform could be blocked. Check Affiliations field in your profile or directly a Blue Board(s) your profile affiliated with. If there is no Blue Board affiliations in your profile feel free to submit a support request. 9.1 - How can I send files to other site users? 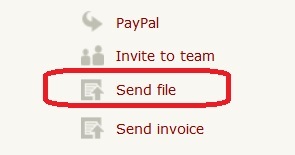 You can send files to any ProZ.com user by clicking on Send file (beta)... at the top of the addressee's profile page. A box should pop-up, allowing you to select a file from a list of recently uploaded files or to upload a new file. You will also be given the option to specify your file type (work file, translation memory, glossary, reference file, contract, invoice, CV/resume or other). Finally, a comment may be added to the file sent. Note that the Send file function has been designed to send work-related files. Use of this tool for other purposes is not permitted. 9.2 - Can I send multiple files to more than one site user at the same time? No. Though you can send as many files as you need to more than one user, this cannot be done at the same time. To send several files to more than one user, you must visit each user's profile and use the Send file function as described in 4.7.1 one time for each file. 9.3 - What type of files can be sent/received? You can send .doc, .pdf, .ttx, .rtf, .txt, .odt, .docx, .odg, .xls, .csv, .tmw, .zip, .iix, .mdf, .mtf, .ods, .xml, .itd, .log, .wps files with texts to be translated, reference texts, conracts, TMs, glossaries, invoices, CVs and other job-related documents. 9.4 - What is the maximum size allowed for files sent/received? The file upload size limit is 5 MB. 9.5 - Will I be notified of files I receive? Yes. A notification will be sent to your email address whenever a file is sent to you via the Send file (beta)... function in your profile. 9.6 - Where can I see received/sent files? You can see a list of sent and received files by going to My files under the "My ProZ.com" tab. 9.7 - Can I also upload files to "My files"? Yes. You can upload a file to "My files" by clicking on Upload file at the top left corner of the My files page. Note that each file you upload cannot be larger than 5 MB. 9.8 - What types of files can I upload to "My files"? You can upload the following file types: .doc, .pdf, .ttx, .rtf, .txt, .odt, .docx, .odg, .xls, .csv, .tmw, .zip, .iix, .mdf, .mtf, .ods, .xml, .itd, .log, .wps. Note that you can upload translation memories and glossaries to the TMs & terms section of "My files". The size limit for TMs and terms files is 10Mb (20Mb for Corporate Members). 9.9 - Can I store files in "My files" for long periods of time? Yes. There is currently no time limit. You will set your own time depending on the space used. 9.10 - Can others access "My files"? If you upload your files as a company, other users at that company will be able to see the files you uploaded. However, no one but you will have access to your translation memories and glossaries. 9.11 - Is there a storage space limit for my files? Yes. The file upload size limit is 60MB for Professional members and 100MB for Corporate members. 9.12 - How can I delete files? To delete a file, just click on the file title and then on Delete this file. 9.13 - How can I download files received? To download a file, simply click on the orange icon next to the file title. 9.14 - How can I be sure a file is safe to download? For files received, you can check for possible virus by clicking on the received file title and then on Analize file. If the file is clean, you will receive an 'OK' message. However, if the file is corrupted, an error message with details will be shown at the top of the file information page. 9.15 - Will I be notified when others receive the file(s) I sent to them? Note that you will be notified when recipients download the files you send them and not when they have received them. 9.16 - Can I specify a language and a field for my TM and glossary files? Yes. You can specify a language and/or a field for your translation memory and glossary files by clicking on [Edit] next to the specific file in the TMs & terms section. Watch a screencast explaining ProZ.com pre-qualified jobs here. 5.1 - What is a pre-qualified job? Getting a small job done quickly can take time. Service providers need to be called, emailed to see who is available, files transferred, POs issued, all before the work actually starts. This means wasted time for outsourcers and service providers alike. Pre-qualified jobs are designed to solve this problem--and eliminate the wasted time, allowing you to get your project done faster. Upload your files, choose who you want to work with, get the job assigned to one of your pre-qualified vendors--and get the job done! 5.2 - How do prequalified jobs work? Pre-qualified jobs are a tool for streamlining the process of assigning language jobs to qualified service providers. 1. The outsourcer uploads the job and chooses qualified service providers, who are automatically invited a few at a time. 2. The first available service provider accepts the job, and a PO is generated. 3. The service provider completes the work, delivers the file, and submits the invoice. 5.3 - How are pre-qualified jobs different from other ProZ.com jobs? 5.4 - What are the benefits of pre-qualified jobs for outsourcers? 5.5 - What are the benefits of pre-qualified jobs for service providers? 5.6 - Who can post pre-qualified jobs? Full ProZ.com members and corporate members can post pre-qualified jobs, provided they do not have a Blue Board average LWA of less than 3 and that there are no open non-payment reports in their Blue Board. 5.7 - Where can I post a pre-qualified job? To post a pre-qualified job go to the Jobs tab at the top of the page and click on "New job posting". For more information, watch the screencast here. 5.8 - Who can reply to pre-qualified jobs? Any ProZ.com free user or paying member can reply to a Pre-qualified job invitation. Only those invited by the outsourcer will be able to reply to a pre-qualified offer. 6.1 - What are private job postings? Private job postings are similar to other ProZ.com job postings except that they are visible only to a specific list of eligible service providers. Others will not see any identifiable information about the job posting (though certain generalized information such as language pair and field of expertise may be listed publicly, in order to show general market activity and trends). 6.2 - What is the purpose of private job postings? In some circumstances, outsourcers who might otherwise post a job at ProZ.com refrain from doing so because they don't want their search activity to be publicly visible (ex. to their clients or competitors). Private job postings allow outsourcers to make these job opportunities available to eligible service providers at ProZ.com. While this might decrease the number of job postings that are visible to any particular user, the goal is that it will increase the overall number of jobs passed through ProZ.com, and improve the relevance of job postings accessible to each provider. 6.3 - How are eligible providers for a private job posting determined? The outsourcer may explicitly specify providers who are eligible. The system can also attempt to automatically identify eligible providers, if the outsourcer allows it. To do so, the system searches for providers with relevant language pairs, native language, field of expertise, etc., taking into account provider job notification preferences. Prior relationships between the outsourcer and provider are also considered, including the feedback they have recorded about each other. 6.4 - How can I be considered eligible for more private job postings? 6.5 - Why can't I access a particular private job posting? I think I meet the eligibility requirements. Outsourcers have a fine-grained control over the list of eligible service providers for their job postings. An outsourcer may choose to direct a job posting to a specific list of providers, regardless of their profile information. 6.6 - Are private jobs also subject to vetting? Yes. Private jobs are vetted by ProZ.com staff, in line with site rules for job posting. Private job postings are identical to other classic job postings, except that only eligible providers are allowed to access them. 7.1 - What is turn-key translation? Turn-key translation is a ProZ.com service that helps clients and translators do quick-turnaround translation jobs with a minimal amount of overhead. The client submits text and payment, and then receives the translation. The translator accepts the job (if interested) and translates the text. There is no need to quote because qualification is determined in advance. The prices are fixed so there is no negotiation. Clients pay in advance and payment is guaranteed by ProZ.com. The job can be reviewed in its entirety before acceptance, and payment is made shortly after completion. All the translator needs to do is translation. 7.2 - How will I get paid? Payment will be made to your ProZ.com wallet within 15 days after successful delivery and in USD currency only. See the service provider agreement for details. 7.3 - Is there any fee for receiving payment via my ProZ.com wallet? ProZ.com does not charge a fee for processing wallet withdrawals, but you are responsible for paying any third-party transaction fees. See the wallet page for more details. 7.4 - How is invoicing handled? At this time, the system does not collect or issue invoices from translator to client. If your tax authority has specific invoicing requirements, you may not be able to use the turn-key translation service in its current state. If you need an invoice for accounting purposes, you might consider creating an invoice in your system as a placeholder for the transaction. If there proves to be a demand for this service, invoicing capabilities will be added to the system. 7.5 - How are taxes handled? You are responsible for any taxes that may be due on your payment. The amount of any taxes due is considered to be included in the total payment amount offered for the task. At this time, the system does not calculate or collect any taxes. If your tax authority requires that you collect or pay taxes on such transactions, it is your responsibility to handle this outside of the turn-key translation system. If you are unclear about your tax obligations for the use of this service, you are advised not to use the service at this time. 7.6 - How are the rates determined? Currently, while the system is in its "beta" stage, pricing is deliberately simplistic as a placeholder for future development. At this time, regardless of job details, the system charges the client based on a fixed per-source-word rate for the provider and a per-source-word transaction fee to ProZ.com. The fixed rate is offered to eligible service providers, who can choose to accept or decline the job. If there proves to be a demand for the turn-key translation service, a more detailed pricing model will be developed based on real world data and usage patterns. 7.7 - What if the client has complaints about the quality of my translation? You will be given the opportunity to correct any defects found in your translation. If the corrections are not satisfactory to the client, or if there is any other dispute, it will be resolved at the reasonable discretion of ProZ.com staff. Such resolution may include a full or partial reduction of your payment. See the service provider agreement for details. 7.8 - What if I am unable to deliver the translation on time? Please alert ProZ.com staff as early as possible if circumstances arise that prevent the agreed upon deadline from being met. If you do not deliver the translation on time, you are not entitled to any payment and the task may be reassigned to another service provider. You may also be excluded from future assignments. See the service provider agreement for details. 7.9 - How is the translator chosen for a turn-key translation? What criteria are used to determine eligibility? Note that Certified PRO status and ProZ.com membership are not required for eligibility, though they will be taken into consideration when determining the order in which eligible providers are invited. In the future, the system may provide an option for the client to have more control over the selection criteria. 8.1 - What is turn-key translation? What's the advantage for clients? Turn-key translation is a ProZ.com service that helps reduce the overhead costs for short, quick-turnaround translation jobs. Just submit the text and payment, and then receive the translation. The system automatically handles routing the work to suitable translators, delivering the completed work back to you, and paying the service providers. 8.2 - For what type of work is the system intended? The turn-key translation system is intended for quick translation of relatively short texts. This type of work has been described as a hassle for translation companies, perhaps because the overhead involved in getting the work done may exceed the value to the client. The turn-key platform attempts to reduce this overhead cost. At this time, only plain text can be translated. Texts in other file formats may be copied into the system, but the non-text formatting is not preserved. In the future, support for additional file formats may be added. 8.3 - How will I receive the completed translation? You will be notified via email when the translation is completed, and given a link to the order management page from which the translated text can be retrieved. 8.4 - Is ProZ.com a translation agency? No. ProZ.com provides a platform for clients, translators, and translation agencies to meet and get work done. Acting as an agent for clients is not in line with ProZ.com's mission; both agencies and end clients are considered to be potential users of the turn-key translation service. 8.5 - If I order a translation and find a great translator, can I work with him/her directly next time? Absolutely. Once you have established a relationship with a ProZ.com translator, you may find it is in your best interest to continue working directly with that person. Nurturing a long-term service arrangement will bring benefits over time, as the service provider will be able to deliver high quality work in a shorter period of time, as he or she becomes increasingly familiar with terminology and information specific to you or your company. 8.6 - What fees are charged? The quote presented when an order is placed includes the payment that will be made to the translator and a transaction fee to ProZ.com for use of the platform. In some cases, the payment processor you choose may charge an additional transaction fee--this fee will be clearly displayed before you are charged. 8.7 - How is payment handled? When you order a translation, you deposit the full payment amount in advance into escrow. 15 days after the translation has been delivered, the funds will be released to the provider(s). 8.8 - Which are the currencies available for Turn-key jobs? For the time being, Turn-key jobs will only be payable in USD. 8.9 - How are tax issues handled? 8.10 - Is the translation reviewed by a second provider before being delivered? At this time, the work is done by only a single translator. In the future, an additional option may be provided to have the work reviewed by a second service provider for an additional fee. 8.11 - What if I am not satisfied with the translation that is delivered? Submit a complaint in writing to ProZ.com within 7 days after the translation is delivered. The escrowed funds will be placed on hold and a dispute resolution process initiated. If the outcome is in your favor, you can have a refund or a re-translation at no additional cost. 8.12 - The language pair I need for my job is not available in the list of language pairs for Turn-key jobs. What should I do? If the language pair you need for your project is not available in the list of language pairs currently available for Turn-key jobs, please submit a support request, specifying such pair so that staff can evaluate the possibility to include it in the list. 9.1 - I am not getting any email notifications of jobs. - you have not selected Job email notifications in your email preferences. If after checking the above you can not find the problem, enter a support request with a link to at least one job of which you should have been alerted. 9.2 - What is the criteria taken into account for classic jobs notifications? Thus, when receiving a job notification what you are receiving is an alert that a job was posted in the language pair reported in your profile, in one of your fields, within your rates and looking for one of the services you offer. But this is just an alert. To the see the job's details, you must visit the job posting. 9.3 - I am not getting all the email alerts I should be for jobs. Subject area: make sure the subject field specified by the outsourcer for their job is one of the fields reported in your profile. Note that oustourcers sometimes specify more than one subject field for their jobs. Make sure you have reported all fields selected by the outsourcer, and not just one or two of them. You can report fields here. Software: make sure the software required for the job is listed as software in your profile. You can edit the list of software you use from your Profile Updater. Rates: translators will not be notified of jobs where the offered rate (if any) is below the minimum rate declared in their profile. (If necessary, currency conversion is performed using exchange rates from xe.com.) You can edit or enter the rates declared in your profile here. Services required: Note that jobs are classified into Potential, Interpreting and Translation/editing/proofing job. Check the services you have reported for the language pair in which you are interested from your Profile Updater by clicking on Edit next to each of the language pairs you reported. Credentials: Some outsourcers prefer to receive quotes from service providers who have reported credentials in their profiles for the language pair required for the job. To report your credentials go to your Profile Updater and click on 'Add credentials' next to the corresponding language pair declared in the 'Language pairs' section. A window will pop up allowing you to report any professional credentials, certifications or accreditations you have earned from recognized authorities. Location: make sure the location specified by the outsourcer matches the location reported in your profile. Remember you can enter your contact details in your Profile Updater. Native language: Note that some outsourcers prefer to receive quotes from service providers who have reported a specific native language. You can report your native language here. Also, check your jobs dashboard to see your notifications preferences are set correctly. Note that apart from turning on your Classic Notifications settings, you must chose to receive immediate alerts for each language pair. Selecting working fields will include your specialty fields, selecting interest fields will include working and specialty fields, and selecting all fields will include all the fields reported in your profile and not all available fields. In your jobs dashboard, make also sure you have not filtered any outsourcer or that you have not selected a higher average LWA than the average for the oustourcer that posted the job for which you were not notified. Remember you can also check your Mail monitor for more information any time. If you are unable to resolve the problem or need further help, please submit a support request, including the URL(s) of one or more jobs of which you should have been notified. Support staff will check to see whether or not the alert email to you left the ProZ.com servers. (If it did, there may be a problem, or filtering, happening at your ISP or on your local computer.). 9.4 - Why am I not notified of all jobs in my language pair? Even when your email preferences specify that you would like to be notified of "all" jobs in your language pair, there are a number of criteria used by the system to determine who to notify of new job postings. For example, outsourcers may specify that they only want to notify translators in a certain country, or those with certain software. Selecting "all notifications" only ensures that you will receive the job notification if the outsourcer did not specify any such detailed restrictions. 9.5 - Why are job alerts sent to me some time after they were posted? There seems to be a delay. Some job posters are able to post jobs that appear immediately. Posting made by others require vetting. Email alerts can not be sent until the time such jobs are vetted. This is why the time you receive an email may be several hours later than the time the job was posted. When notifications are sent, they are sent to all users fairly; normally all notification emails leave our servers within 5 minutes. Another factor to consider is the difference in timezones. By default, times are shown on the site in Greenwich Mean Time (GMT). Therefore, depending on your geographical location, it is possible that the time on your job notification compared to the job posting time will appear to be different; however, if you take into consideration the difference between the time displayed by the site and your email client, you will see that the email notification was actually sent out minutes after the job was vetted and made public. If you are experiencing delays not explained by the above, please submit a support request, including the URL of the job for which your email was delayed. We will be able to look up the exact time the message left our servers. 9.6 - What are "Classic" job posting notifications for Corporate members? As of May 2016, Corporate members have the option to receive notifications based on the fields declared in their company profiles. Company profiles are not bound by requirements that only make sense when the service provider is just one person, such as "Native language". With this tool, Corporate members can choose to be notified of all the job postings that they can submit a quote on. This is done by comparing the requirements in the job posting with the working languages they have declared that their company provides services in. 9.7 - I received a job notification through ProZ.com that did not come through the directory, direct profile contact or from a ProZ.com job post, what is it? An interface ("API" or Application programming interface) is being developed which allows clients to search for and contact ProZ.com members for paid work from their own translation platforms. In essence, this interface represents a potential additional channel of client contact for ProZ.com members. The interface is currently being tested with a limited group of volunteers. Translation clients can use the interface to look for language professionals based on various search parameters, much in the way clients use the ProZ.com directory. Clients may then select candidates to contact for potential work through their translation platform. Initial contact is handled via an invitation which the language professional receives through email. The recipient is given information regarding the client and project, and may respond by email. The recipient's contact email is not disclosed unless they choose to respond to the invitation. Potential clients who use this interface to search for language professionals will only see a sub-set of the information that you have chosen to make public in your ProZ.com profile, similar to the data that is shown in the ProZ.com directory. No information which you have not made expressly public in your ProZ.com profile is shared with potential clients unless you choose to do so. Work relations beyond the acceptance of an invitation to collaborate are the responsibility of the the client and the service provider. When considering working with any new client, service providers are encouraged to perform adequate screening and risk management. Remember that, similarly to the ProZ.com directory and the jobs posting system, certain information you enter in your ProZ.com profile can help better connect you with the kind of potential clients you are seeking. Declaring your rates (even if you choose to keep them private) will help prevent client contact from those seeking translation services below your rates, for example. If you have further questions about how this works, please contact the ProZ.com site team via support request. 9.8 - What is the RSS feed for jobs? RSS is an acronym for Really Simple Syndication, a family of Web formats used to publish frequently updated content such as news headlines or blog entries in a standardized format and that allows users to subscribe to it. A feed reader is client software or a Web application that is used to subscribe to and collect syndicated web content in a single location for easy viewing. You can track job postings matching your preferences in your RSS feed reader by clicking the orange button in the jobs page to get started (your feed will be based on your advanced search settings there). To see the complete job description and to quote, you will need to visit the full job page using the link in the feed item. The feed contains the basic information about the job, including the link to the job, the job title and short description, and the job requirements (including language pairs and field of expertise). The feed updates once every five minutes. You will notice that the URL for the feed contains your entity_id and a unique token that allows you to view job summaries that match your preferences without logging in. You cannot use this token to log in or to access any part of the site. Additionally, the token and feed does not contain any personally identifiable information about the subscriber. You can subscribe using any news reader that you would like. If you encounter any encoding issues or have questions, comments or concerns, please contact site staff via a support request.